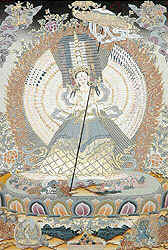 One of the eight auspicious symbols is a parasol, depicted as held by the deity at left. Here, it symbolizes Refuge -- supreme protection. In the tropics the parasol or umbrella is a symbol associated with royalty. Its purpose is not only to protect by creating shade; it designates the dignitary proceeding through a throng of people. See 21st birthday of Karmapa celebrated in Kathmandu 2006. In Holy Teachings of Vimalakirti (trans. R. Thurman) a wondrous canopy is created which does not create shade. It does the opposite; it sheds light.